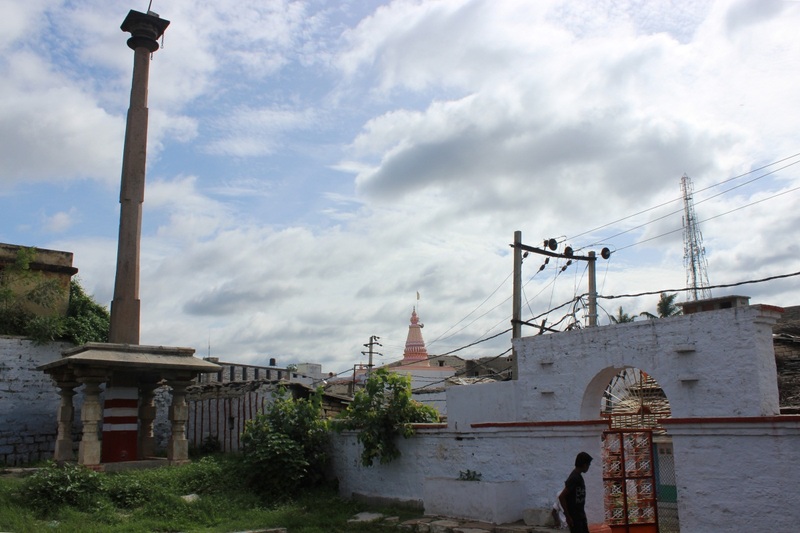 Second item of the day was Bananthi Kambha of Manikeshvara temple. 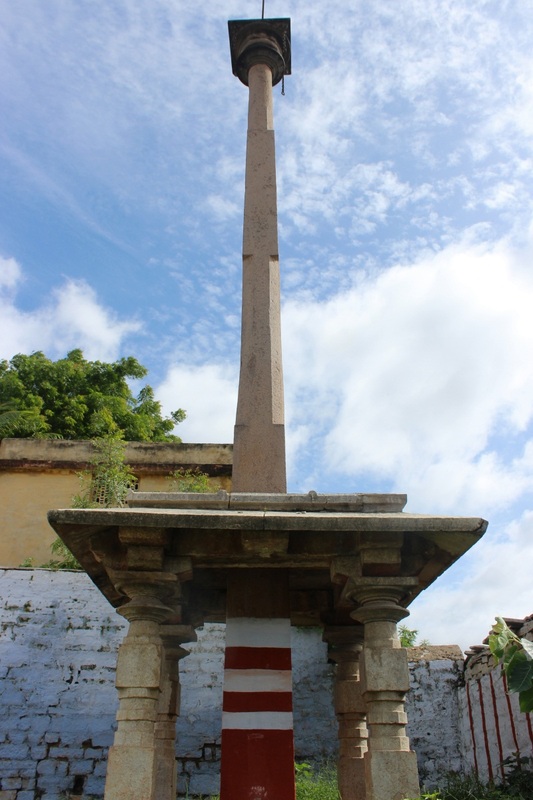 In Kannada 'Bananti' means pregnant woman, however local people say there's no connection between progeny and this pillar. The name is said to be derived from a story of a rakshasa.. sorry no further information. The pillar is definitely ancient, probably 600 to 1200 years old. Though sources say ancient temples of Sedam are of Kalyana Chalukyan period, I think Hoysalas have left their marks here. This Bananti Kambha seems very much Hoysala or probably from Vijayanagara times. 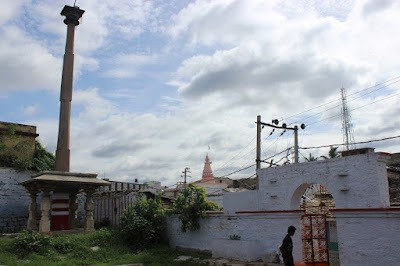 Now this is the front portion of Manikeshwara temple. 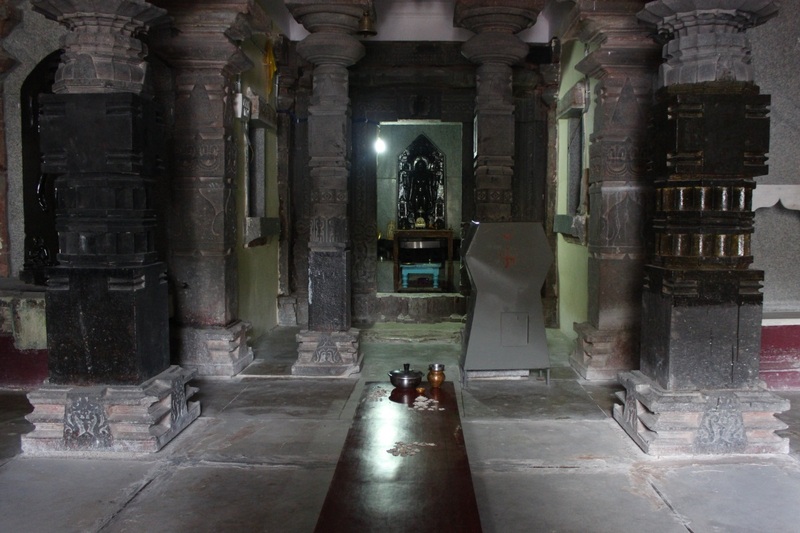 Unlike other temples, Manikeshwara Gudi's width is more than its depth. This is probably the Mukha-Mantapa. 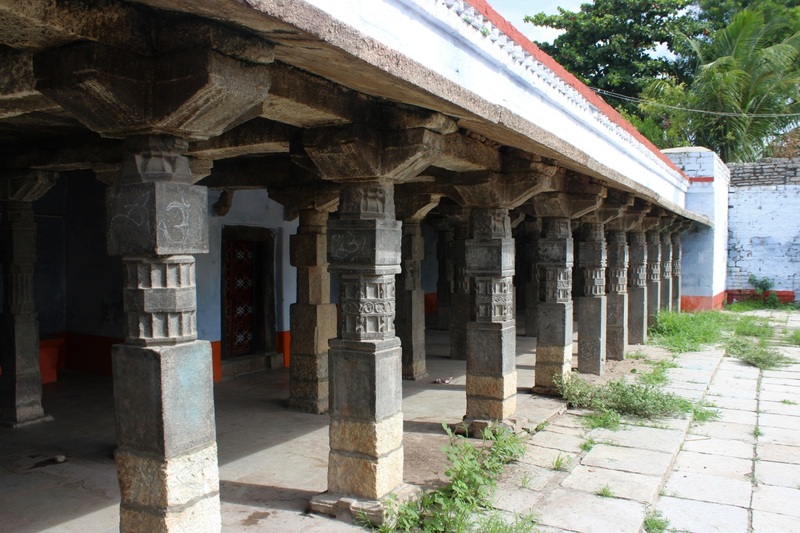 The dark hard stone these pillars are made of is typical to Gulbarga region; pillar design seems Chalukyan. Its possible the original Stambha of this temple was replaced with the pillar standing here. 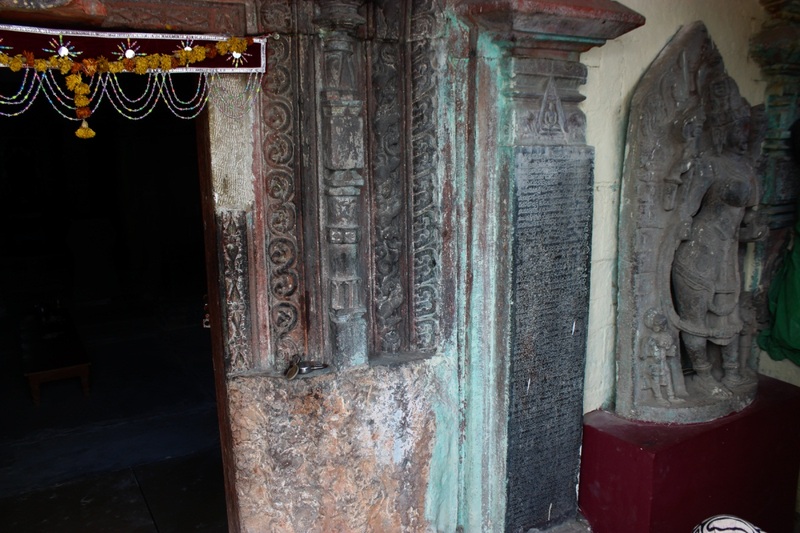 This temple gates are usually kept locked to keep out vandals. It seems like rituals are performed every morning then its doors are shut for the rest of the day. Possibly an annual fair is held here. 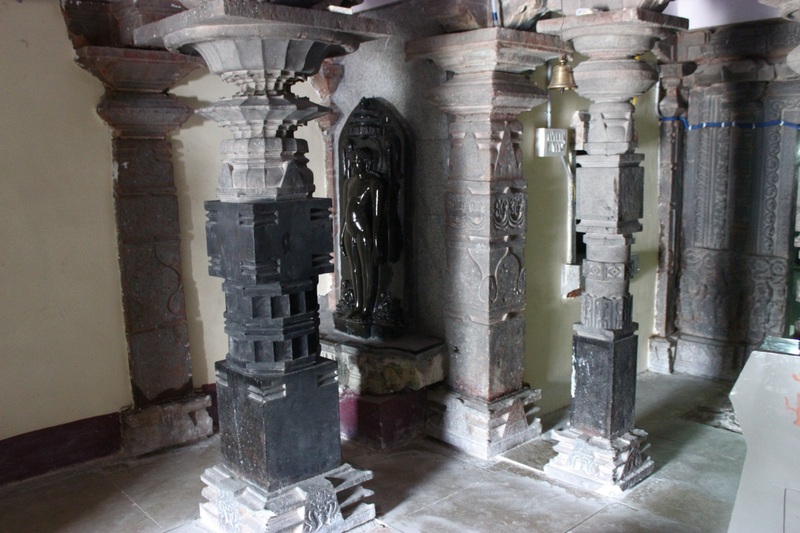 Having done with the tallest monolithic pillar of Sedam, we go in search of Jain Basadi. Negotiating the dug up and filled back narrow streets of old Sedam was a challenge, At places its barely wide enough for a small car and a scooter. After 10 minutes of struggle in the maze we located the Basadi. 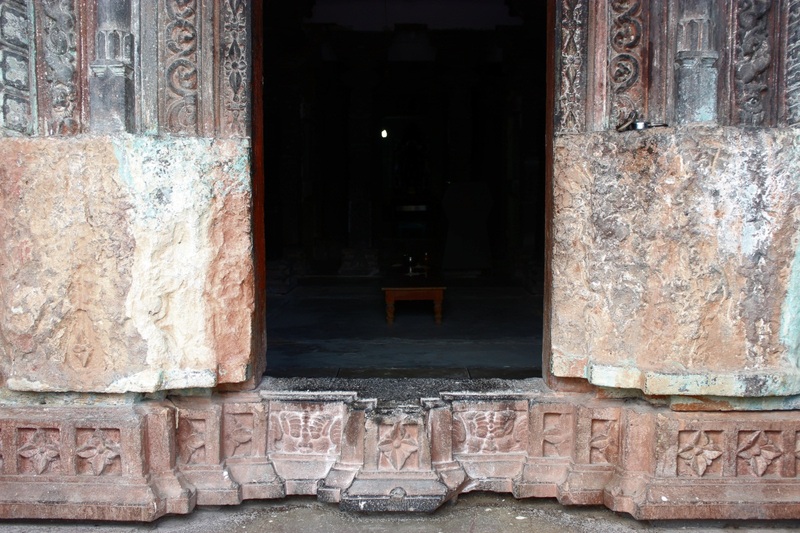 From the outside it hardly looks ancient but we stepped in, the sight of these richly sculptured pillars.amazed us. 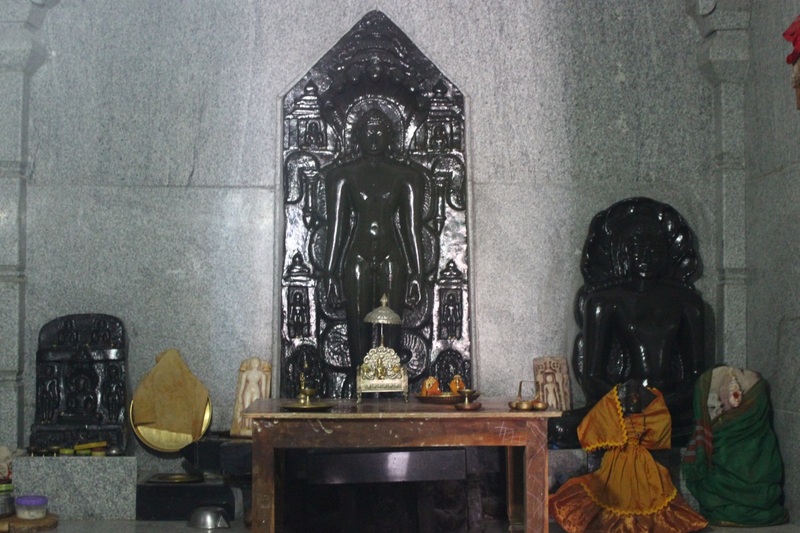 This little shrine is taken care of by a Jain family. The pillars are Chalukyan. 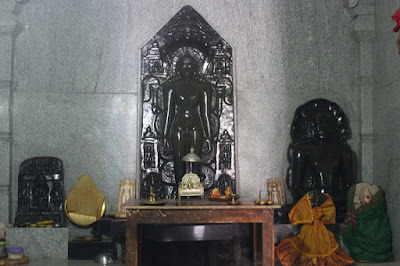 Beautiful idols of Jain Theerthankaras. They could be of black granite. Closer look at the ridged section; this is not a simple task to carve out evenly spaced out ridges on a circular object with varying diameter. No words to describe this beauty. Now turning attention towards Mantapa ceiling, this is a seriously complex design. Every geometrical form can be seen here. Probably one can sit here and gaze at this art for an entire day and still miss something. Wondering the states of minds of persons who created this. 3-D floral sculpture within a square placed diagonally in a square which in turn is positioned diagonally in a larger square. 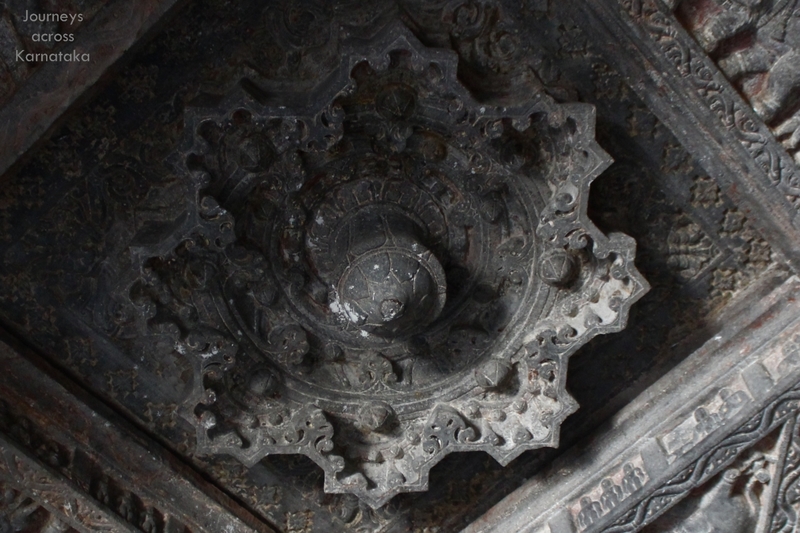 Triangles formed by these squares are filled with elephant stories from Hindu legends. 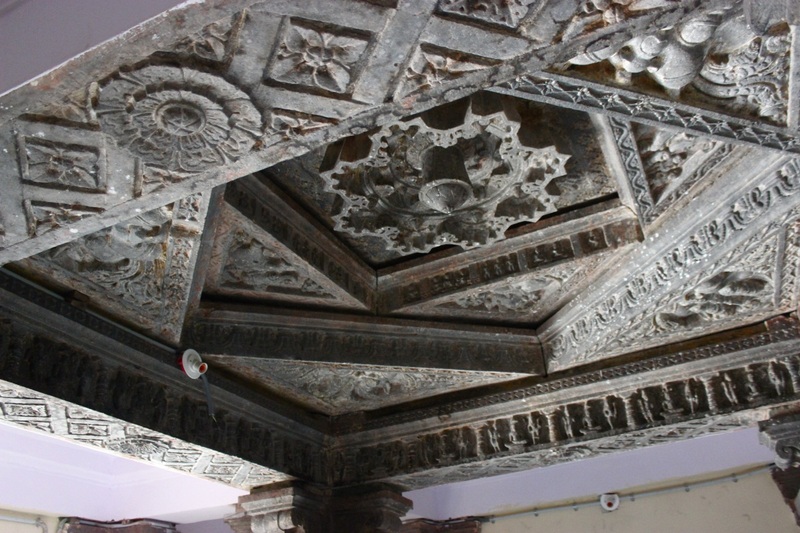 A similar piece of work can be seen at Panchalingeshwara temple here at Sedam, barely a kilometer from this Basadi. Zooming into the floral centre; its a culmination of eight 8-sided stars having a lotus core. How can one create a flawless work of art? What patience, what concentration when at work! 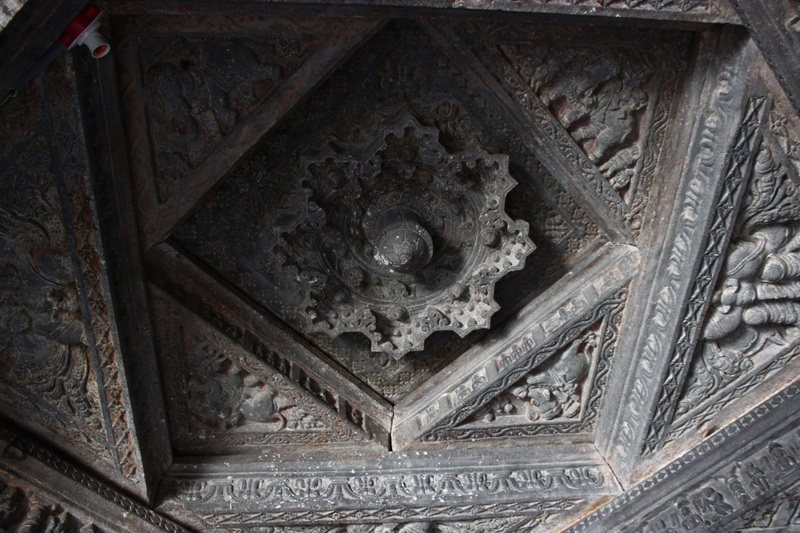 Take a closer look at the square's rim, you can see small Jain Theerthankaras in standing and sitting positions. At the temple's doorway re two standing woman idols. 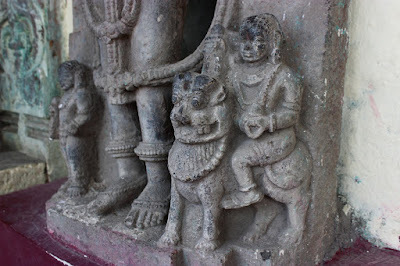 Close to the feet of the woman is a man astride a lion.. this seems to be Sala, from whose name originated the name Hoysala. 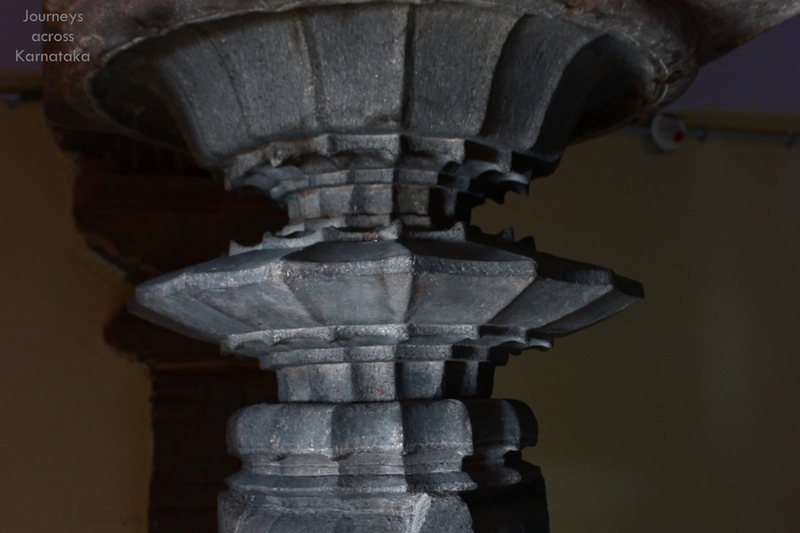 So is it OK to call this a Hoysalan creation? The female figure guarding the doorway framed by a pointed arch. 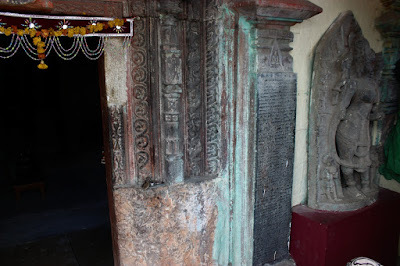 Also on the pillars flanking the entrance are Kannada inscriptions. 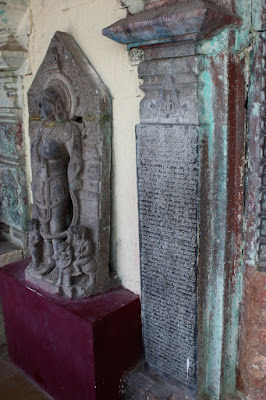 The letters are legible, Overall the temple has Hoysalan characters. The other quard and inscription. The upper portion of the door frame is a highly detailed piece of sculpture. However the lower half is rough cut stone. Was it left that way intentionally. 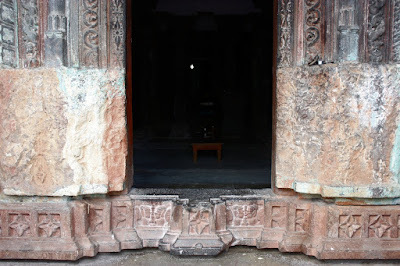 The door-frame and Hochchala ~ Kannada word for floor part of the door-frame. We were hungry, we head back towards Chauras, the junction where four roads meet. We find a cart-eatery vending fresh hot idli, vadae and dosae. Our breakfast was light, few idlis and a dosae between us two. Hunger taken care of.. burpp. We ask for the our next item on our list- Kottala Basaveshwara Gudi. Feel like I'm there with Sid explaining me descriptively the intricacies of the pillar and stone carvings.... excellent Siddeshwar! !